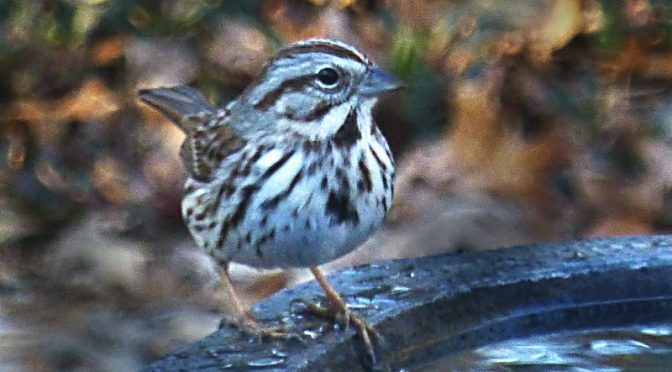 Cute, Little Song Sparrow Getting Ready For A Bath At Our Home On Cape Cod! We have so many different species of birds that come to our bird bath, for either a drink or a bath. They especially like it in the winter when many of the ponds and bird baths are frozen. We have a little heater in ours which keeps it from freezing, so the birds can always get a drink. When we were building our home 3 years ago, that was one thing on our list that the electrician couldn’t quite understand. Yes, we wanted a plug out by the bird bath so we could have a heated bird bath all winter long. It’s a win, win for all of us! Previous PostOur Wiley Park Loop Hike On Cape Cod Is On The AllTrails App.Next PostHappy Valentine’s Day From Coast Guard Beach On Cape Cod! No wonder the Tulin Resort and Spa with Bountiful Buffet is so popular!